Hop aboard your private Lake Tahoe boat rental and let the summer fun begin! There is nothing like the freedom of having Lake Tahoe at your disposal. So let that wind rush through your hair, the sun warm your face, and take in the most amazing views in the world as you cruise to your secret cove or hidden beach. Boating isn’t on your list? Well, there are many other rental options and services available, and South Lake Tahoe is a prime launch point for fun on the water. Check out Birkholm’s Water Ski School for lessons that the whole family can enjoy together. They also offer tows, wake boarding, water skiing, and tubing, plus relaxing scenic water tours and romantic sunset rides. Spend the day at Round Hill Pines Beach and Marina. 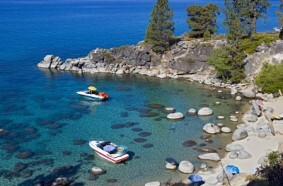 They are your source for Lake Tahoe jet ski rentals, motorized and non-motorized boat rentals, and Emerald Bay Cruises. The Ski Run Boat Company is another fantastic provider of summer fun as the largest boat and ski rental company in Tahoe. Experience the thrill of Lake Tahoe para-sailing. Tour gorgeous Emerald Bay on your own schedule. Hop in a paddle boat and take a slower ride on the jewel of the Sierras. However you choose to experience Lake Tahoe, there are many boating and watersports companies standing by to help you on your way to that perfect summer’s day.